NASA’s faraway Juno spacecraft will remain in a highly elongated orbit around Jupiter for the remainder of its mission as engineers opted against performing a burn of the craft’s rocket engine that is considered too risky after a pair of valves within the propulsion system had shown a suspect signature. 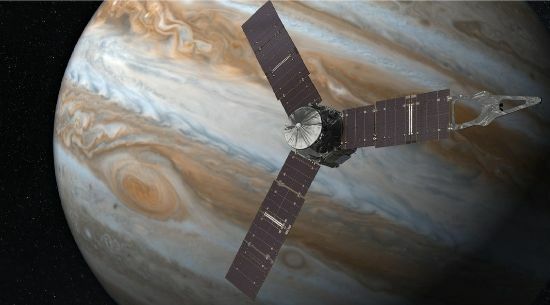 The elongated orbit means the spacecraft’s close passes over Jupiter’s cloud tops – when the most valuable scientific data is collected – will be few and far between, however, no significant loss of mission science is expected from the decision. When NASA sent a series of commands to Juno in October to prepare for the firing of the craft’s main engine, two helium check valves that play an important role in the main propulsion system were sluggish to open – taking several minutes to reach their fully opened position, a configuration normally achieved within a few seconds. Not willing to endanger the $1.1-billion mission, NASA decided to skip the rocket burn, known as the Period Reduction Maneuver, giving engineers time to study the unusual valve opening. 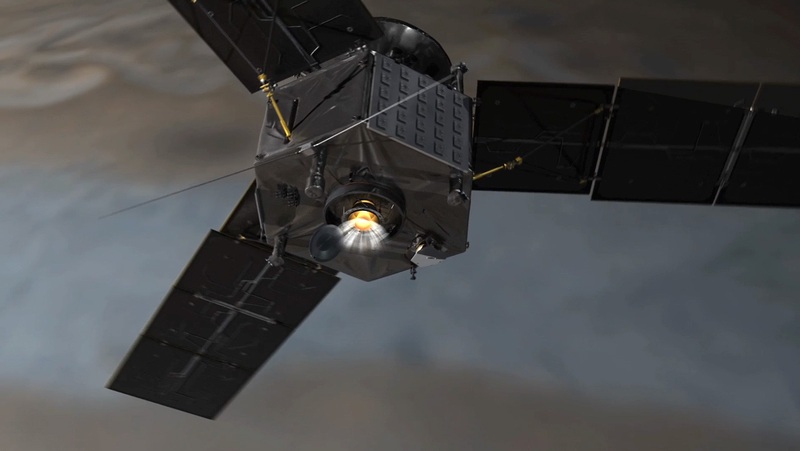 Juno had used its Leros 1b main engine twice in 2012 to adjust its orbit around the sun to set itself on a course to a 2013 Earth flyby maneuver to slingshot out toward Jupiter. 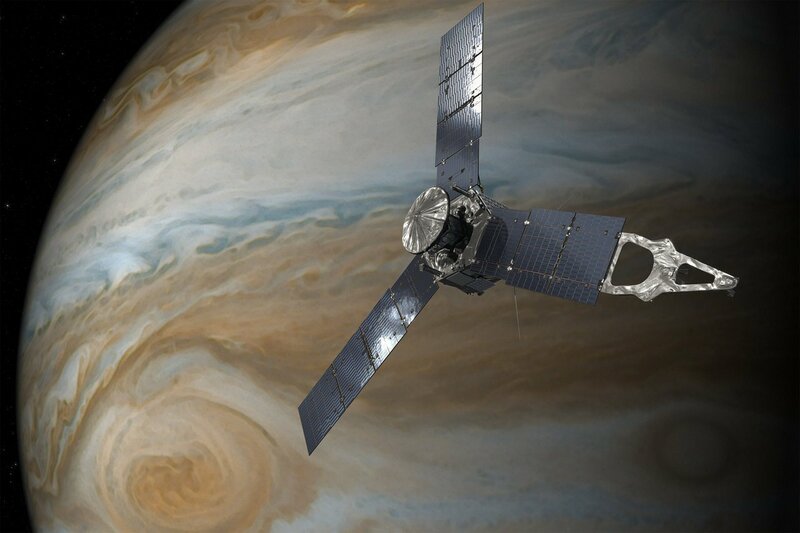 The engine was fired again on July 4, 2016 to slow Juno down to be captured in an elliptical orbit around Jupiter taking 53 and a half days for one lap around the gas giant. The Period Reduction Maneuver was planned to be the final use of the bi-propellant engine, intended to spiral Juno down into a 14-day science orbit. The two helium check valves are responsible for allowing high-pressure helium to be routed from storage tanks through pressure regulators and into the propellant tanks to keep them at the proper pressures required by the pressure-fed main engine. The main purpose of the check valves is to remain open when helium is flowing into the propellant tanks and close to prevent reverse flow & mitigate propellant vapor migration into the pressurant tanks. The Period Reduction had the primary purpose of increasing the frequency of close science passes during which most data is collected – the geometry of the close flyby is nearly identical in the 53.5-day capture orbit and 14-day science orbit. 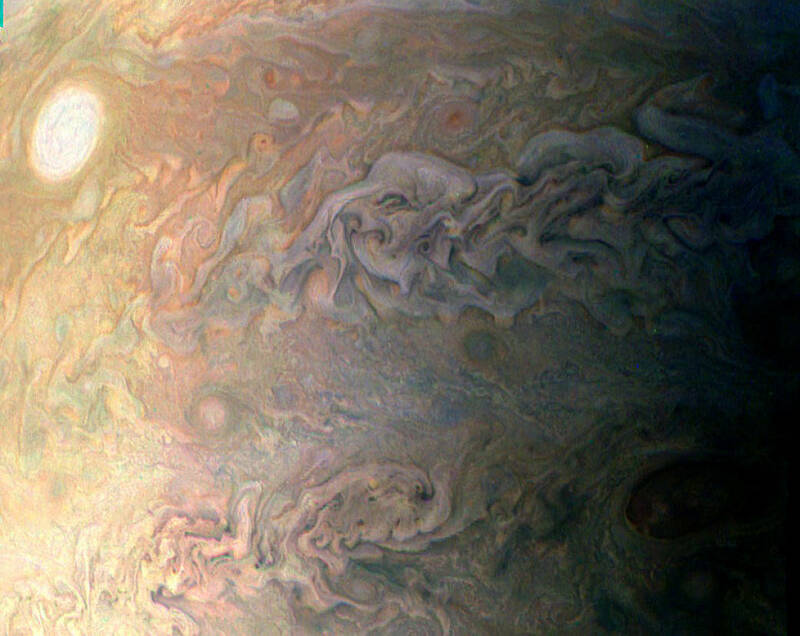 Juno collected science measurements on August 27, December 11 and most recently on February 2, employing a suite of nine instruments to study Jupiter’s enigmatic auroras, the planet’s intense magnetic field and peering into the depths of the Jovian atmosphere to uncover what lies hidden beyond the dense cloud tops. Carefully weighing the risk of firing the engine with the known fault of sluggish check valves, mission managers decided to forego the Period Reduction Maneuver altogether and keep Juno in the longer Capture Orbit for the remainder of its mission. 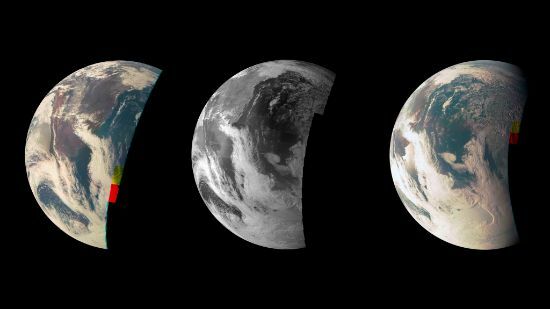 One of the issues faced by engineers was the possibility of an engine underperformance leaving Juno in a less favorable orbital geometry for observations, also looking at illumination requirements as Juno can not afford lengthy solar eclipses. Engineers studied the possibility of operating the main engine in blowdown mode – that is pressurizing the tanks before the burn and then allowing pressures to gradually lower as propellants are expended during the burn. This mode is normally not available for Leros 1b and posed the risk of causing damage to the spacecraft by running the engine outside its operational environment. 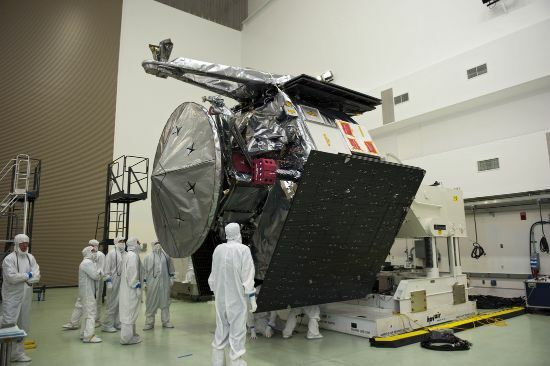 Keeping Juno in the relative safety of the Capture Orbit ensures the craft experiences a minimum of radiation, has a healthy power budget and can collect valuable science data with equivalent quality to measurements expected from the lower orbit. The higher orbit, stretching as far a eight million Kilometers from Jupiter, also allows Juno to gather some bonus science that was not part of the original mission. Venturing out to a large distance after each close pass allows Juno to explore the far reaches of the Jovian magnetosphere including the far magnetotail, the southern magnetosphere and the magnetopause – putting its magnetic and electric field sensor packages to good use to model the make-up of Jupiter’s magnetic environment and how the planet’s magnetic field interacts with the solar wind. 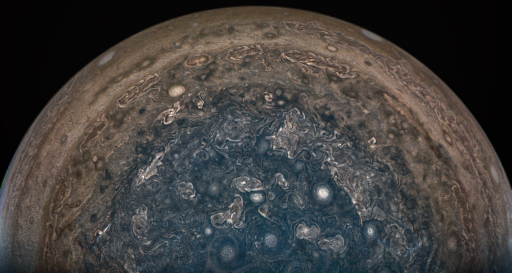 Of course, keeping Juno in the elongated orbit comes with a number of drawbacks, first and foremost the much smaller number of science passes over the course of the 20-month primary science mission. 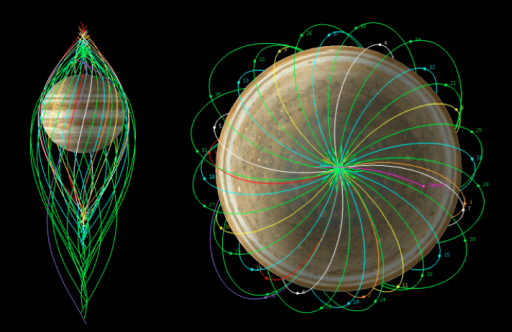 Originally, Juno was set for a total of 36 orbits around Jupiter before the planned end of mission in February 2018 – with the new plan, there will be only a dozen science orbit through July 2018 when Juno’s current budget plan ends. The main life-limiting factor for Juno was the intense radiation in close proximity of Jupiter and there was only a limited possibility of extending the mission beyond the 2018 cutoff. In the 53.5-day orbit, Juno experiences a much lower radiation dose and could therefore be operated beyond the original end-of-mission date, though it is doubtful that Juno would stay alive four additional years to reach the original 36-orbit goal. 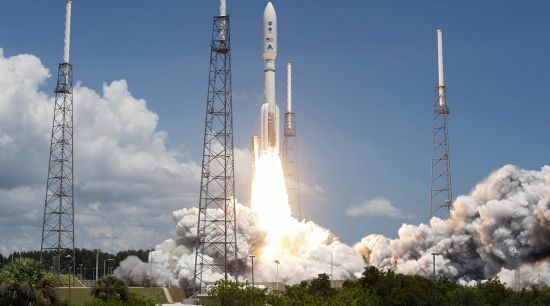 Operating the mission beyond the current budget plan will require the project to make a formal proposal for a mission extension that will be evaluated based “on the merit and value of previous and anticipated science returns,” according to NASA. As previous cases have shown, the agency is unlikely to deny funding to a planetary mission that has already reached its destination and is actively gathering valuable scientific data. Approximately $35 to 40 million are needed to operate Juno for a full year, funds that have to be found somewhere in NASA’s planetary science budget. 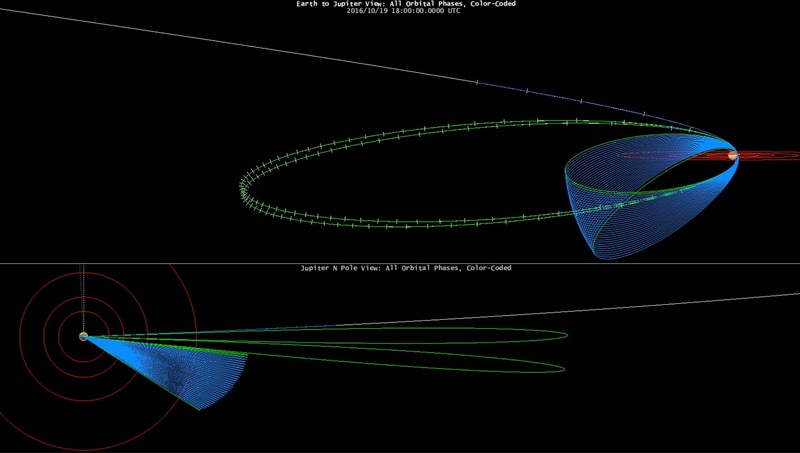 Barring any radiation-induced upsets, Juno could be looking at a fairly long life in its elliptical Jovian orbit with plenty of fuel available to power the craft’s low-thrust engines used for attitude control and small orbital trims executed regularly to target the desired longitude of each science pass that takes the craft from north-to-south, skimming just 4,100 Kilometers over Jupiter’s dense clouds. Additional maneuvering will be required beginning in June 2019 to gradually modify Juno’s orbit to avoid an eclipse season. Copyright © 2019 Juno. All rights reserved.